Facebook is a biggest social media networks as we all know. Facebook have number of different features for connecting with our friends and other people by using Pages, groups and events. Mostly We like number of different pages just for getting latest updates and news. But the pages have any particular name which we remember and almost every brand, website or any personally have their official page. Like we have Safe Tricks Page on Facebook. But instead of all the Facebook pages have your ever seen any page without name ?? means page with no name and having black portion on the actual page name place. Now today i am going to discuss about creating your own Facebook page without any name just black place instead of name with easy and few steps. If you want to create your own new page follow all the below given easy steps. How To Create Without Name Facebook Page ? 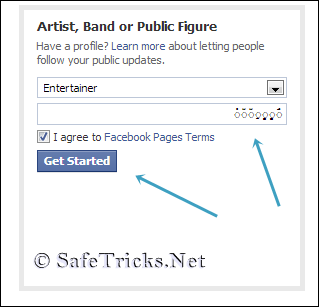 Log in your Facebook account then visit the option create new page or Click here. Now Choose any Specific category which you want. Now Simple copy the below given character. After copy above character paste them in the place of Page name. Now check the box of terms and condition and click on Create Button. Your new page will be create whose name looks like as shown below. Now go to Edit Page >> Then Update Page Info. Click on Edit button of Page name. Then remove all the character present in box of page name. After removing all press Enter button. Refresh your page again and page name will be disappear and you have done. Make sure that all the characters of page name are removed successfully. If you are not sure then check them on both Mozilla and chrome because sometimes Mozilla show no character but chrome show’s. So make sure that page name will get disappear. If you have any question feel free to ask me in below comment box.